The craftsmanship of Peterson Real Fyre Designer Series Gas Logs captures the realism, texture and subtle nuances found in nature. These hand painted originals, modeled from real world samples, are sure to add a touch of elegance to any home. Designer Plus series features more natural color and bark details. The ends of the logs and split pieces are a different color than the bark, and they include red feather detail painting, giving the logs the most authentic look. This Peterson Real Fyre gas log set includes: Ceramic Refractory Vented Gas Logs, Vented Glowing Ember Burner, Custom Grate, Connector Kit, Glowing Embers, Sand, Burner Clips, and Damper Clamp. The Peterson Real Fyre vented G4 Burner, with its single burner pipe, allows the flames to dance through the center of your log set. Burner has a maximum output of 50,000 BTUs. This propane set features a manual safety pilot valve. I rarely give public ratings, but this gas fireplace setup gives me daily pleasure. It is one of the best investments I ever made. A wonderful upgrade to an existing masonry fireplace. No more hauling wood in and ashes out. You can be enjoying a nice fire in seconds. Very well made. Instruction were easy to understand. Had everything I needed to install it quickly. Gas logs adequately simulate real logs. The videos provided by Peterson both influenced my choice and helped me in assembly and selection. Our fireplace is in our family room. the gas logs were my wife's idea. We converted a real wood fireplace in excellent condition to gas logs because it is a lot less work and there is no mess. Great product, love the look and it puts out a lot more heat then the logs that we had. Very well made and quite attractive. Warms our basic living area quickly and adds beauty to the room. The Peterson Real Fyre Split Oak Designer Plus Gas Log Set looks so realistic. Much attention to detail is taken when hand-painting each log. The ends and split sides of the logs are painted differently than the bark and red feathering really gives this log set an authentic look. 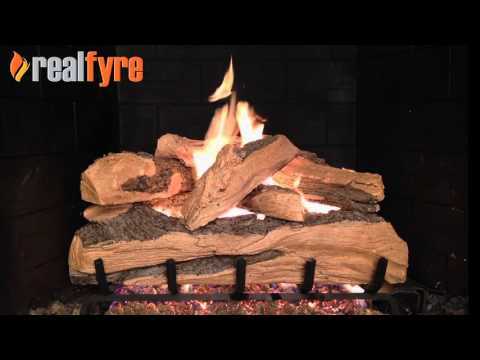 See the Split Oak Designer Plus Gas Log Set in action. What are the minimum dimensions required for this product? I.E. - how tall once the logs are stacked ontop of the grate will it be? Is there a certain requirement for distances on the side so as to not touch the side of the fireplace? Hi Rich! 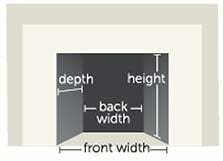 The minimum dimensions required can be found on the product page as well as in the manual. The minimum fireplace dimensions for this set are as follows; Front Width: 36" Rear Width: 34" Depth: 15" Height: 18"